This family consists of 15 genera and 207 species [Updated 04.01.19]. Most species have been described in recent times. There has been a lot of discussion about some of the genera and species in this family, and several genera have been transferred to other families. In a recent revision by Soleglad & Fet, 36 species previously listed in Broteochactas were transfered to a new genus, Neochactas. The genera Cayooca, Guyanochactas and Taurepania have been synonymized with Broteochactas. Three species from Broteochactas have been transfered to Hadrurochactas. The same paper transfered the European genus Belisarius to Chactidae (this genus was previously listed in the discontinued family Troglotayosicidae), but I've now reinstated Troglotayosicidae and moved the genus back again (see Troglotayosicidae for more info). In addition, the genus Uroctonus has been transfered from the family Vaejovidae. The members of this family are known from North America, Central- and South America. Soleglad & Sissom, 2001 transfered the genus Chactopsis to the family Euscorpiidae, but based on the decisions in Lourenco, 2003 and Lourenco et al., 2011, I have moved the genus back to Chactidae until a new family revision is published. There and back again: Soleglad & Fet (2005) have restored the synonymization of Auyantepuia with Broteochactas after Lourenço & Araujo (2004) reinstated the genus Auyantepuia (which before this was synonymized with Broteochactas (and later some species with Neochactas)). Of the 8 species of Auyantepuia, one is transfered to Broteochactas and the others are transfered back to Neochactas (se the species list below for details). Lourenço & Qi, 2007 have published a new species in Auyantepuia, and stating that they do not accept the work of Soleglad & Fet (2005) (Citing Prendini & Wheeler, 2005). Auyantepuia is reinstated in the species list to accomodate the new species until a new revision of the family is published. Jose Ochoa and co-workers published a revision of the genus Chactopsis in June 2013 and creating two new genera (Chactopsoides and Megachactops). 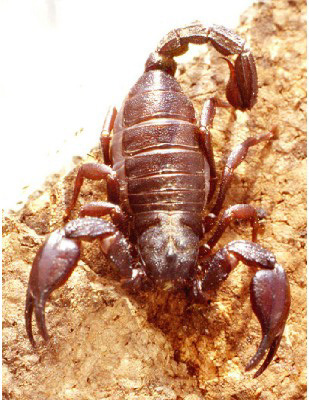 Sharma et al., 2019 have reassed the relationships of Vaejovidae and the high-level classification of Scorpiones and one conclusion from this study is that the status of Uroctonus Thorell, 1876 is incertae sedis, meaning that it doesnt belong to either Vaejovidae or Chactidae. More studies are necessary before its family placement can be decided. Until this happens, I keep the genus in Chactidae. Chactid scorpions are not medically important. As described in the introduction, the genus Auyantepuia has been synonymized with other genera. Lourenço & Qi (2007) have chosen not to accept this synonymization, and described the new species in Auyantepuia. The taxonomy of The Scorpion Files follows Soleglad & Fet (2005), but it is impossible for me to know where to put the new species. I have chosen to reinstate Auyantepuia in The Scorpion Files for this species until a new revision on the family Chactidae is published. Auyantepuia is not counted in the number of genera for the family, but the species are included. As described in the introduction, the genus Guyanochactas has been synonymized with Broteochactas. Lourenço & Ythier (2011) have chosen not to accept this synonymization, and described the new species in Guyanochactas. The taxonomy of The Scorpion Files follows Soleglad & Fet (2005), but it is impossible for me to know where to put the new species. I have chosen to reinstate Guyanochactas in The Scorpion Files based on Lourenço & Ythier (2011) until a new revision on the family Chactidae is published.